House Speaker Nancy Pelosi says it was "irresponsible" on the part of the president in disclosing her congressional trip to Afghanistan and increasing the danger to all involved. House Speaker Nancy Pelosi said Friday that she's pushed back a congressional trip to Afghanistan she was attempting to organize after the Trump administration leaked that she was trying to make the trip on a commercial airline. Pelosi called the move, which the White House denies, "very irresponsible." Asked by reporters if she thought Trump was retaliating for her request that Trump reconsider giving his State of the Union address at the Capitol, given that many government workers responsible for security aren't being paid, Pelosi said, "I would hope not. I don't think the president would be that petty, do you?" Trump hasn't responded to Pelosi's State of the Union request, but a day later, on Thursday, denied Pelosi and other members of Congress a military plane to make the trip, citing the shutdown. He suggested at the time that she could still fly commercially if she wanted to. President Trump lashed out at House Speaker Nancy Pelosi amid the ongoing government shutdown and more troubling revelations about the 2016 election. NBC's Tracie Potts reports. Trump tweeted Friday that he would be making a "major announcement" about the shutdown on Saturday afternoon. Senior American delegations to war zones are usually planned and executed under strict secrecy, since reporting those plans ahead of time would tip-off the enemy on where to attack high-value targets. 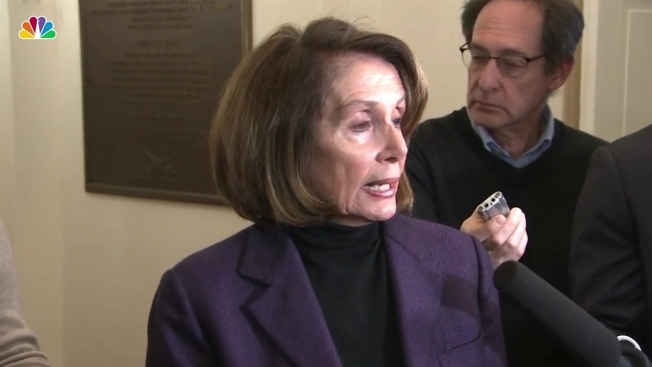 Pelosi spokesman Drew Hammill said in a statement that Trump's revelation of Pelosi's travel plans on Thursday increased the danger to all involved. Hammill said that the delegation had been prepared to make the trip commercially, but Friday morning, "we learned that the Administration had leaked the commercial travel plans as well." The trip was postponed given "the grave threats caused by the President’s action," Hammill said. Asked about the denial, Pelosi said, "I rest my case." Pelosi said that, "You never give advance notice of going into a battle area, you just never do. Perhaps the president's inexperience didn't have him understand that protocol. The people around him, though, should have known that, because that's very dangerous." Trump's initial letter — his first public comments to or about Pelosi after she suggested Trump push back the State of the Union from Jan. 29 until after the end of the shutdown — was sent just before she and other lawmakers were set to depart on the previously undisclosed trip to Afghanistan and Brussels. 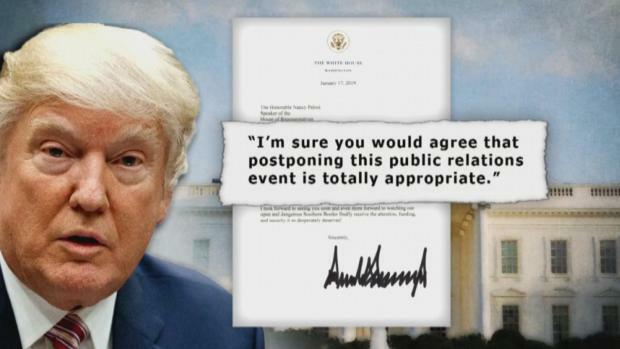 Trump belittled the trip as a "public relations event" — even though he had just made a similar warzone stop — and said it would be best if Pelosi remained in Washington to negotiate to reopen the government. "Obviously, if you would like to make your journey by flying commercial, that would certainly be your prerogative!" Trump wrote. Denying military aircraft to a senior lawmaker — let alone the speaker, who is second in line to the White House after the vice president, traveling to a combat region — is very rare. Lawmakers were caught off guard. A bus to ferry the legislators to their departure idled outside the Capitol on Thursday afternoon. Hammill said that Pelosi was planning to meet with commanders and troops on the front lines in Afghanistan as part of Congress' oversight responsibilities. Her trip was initially scheduled for Brussels as well.